Just because it’s almost August doesn’t mean spring is over, not in the housing market, anyway. Spring in housing was late this year for a number of reasons and the kind of housing market we associate with springtime is, to a great extent, still going on. Many of us in the profession have sensed a shift in the market lately, perhaps a slight quieting, but, overall, as the following stats show, spring has still sprung. Here we see January to June closings for the past 4 years and this year to date (white columns) and the average sales prices and price summaries (gray columns). The number of closings is generally up from 2014 which is an indication of more robust home sales coming out of the recession. Bear in mind that 2017 was the best year ever in terms of number of sales. Closing numbers have generally kept pace with the past, slipping slightly in 2018 because of a lack of inventory. The other half of the chart shows that prices have risen, predictably, mostly in double digits since 2014 and the emergence from the recession. An interesting outlier is Glen Ridge where prices have actually fallen almost 8% since 2014. 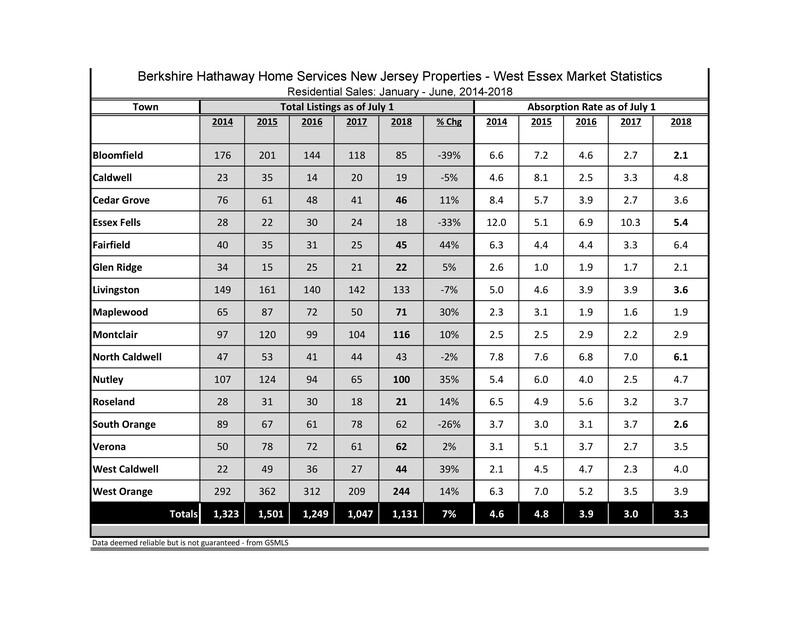 Adjusting for the fact that these stats are averages, it doesn’t mean Glen Ridge is sinking. You’ll see in a minute that what sellers are getting is robust vs. what they ask. Also, keep in mind Glen Ridge only has a population of about 9,000. It’s astounding it’s been the Essex County powerhouse in recent years despite its small size. A few towns have actually have seen this year’s year-to-date prices slip below 2017, most notably Cedar Grove and Essex Fells. In the rest of the County the difference between this year and 2017 is all over the place, with some towns’ prices falling, some rising slightly, some rising at or near the predicted 6% benchmark, some staying the same and a couple rising dramatically. It’s difficult to perceive a trend here, given these differences. The logical conclusion is that different towns hold different attractions plus the fact that there are different price points within certain towns and those market segments are performing differently from other price points. The County average is up a respectable 3.4% overall and the overall average closings are up as well. Now we see the average days on market which, with a couple of exceptions, is down dramatically. This is evidently a function of the robust market coming out of the recession. There is generally a decrease year over year in most towns. The List Price/Sales Price Ratio in the gray columns is the most instructive in appraising the market over the past 5 years. The towns that don’t have triple digit ratios are the towns with the most luxury inventory and are not “train towns”. Everywhere else in the County shows increased demand reflected in sellers getting what they ask or more. The total listings reflected in gray show a general rise in listings as the market improved tempered by a lack of inventory as the market gained steam. Overall, listings are up by 7% but some towns are showing a decrease from 2014 to the present. The absorption rates (the amount of time it takes the market to sell what’s on the market, represented in months) are now, overall, significantly less than 2014. The real striking difference becomes clear if you remember that absorption rates before 2014 were significantly, dramatically, higher. It’s no surprise that the market is absorbing inventory faster in a more robust market. These figures represent what I call an “Robust Normal” market. We have achieved normal growth while experiencing good levels of activity. The anomalous market of 1996-2006 where growth was unnaturally high and the recessionary market of the years after the crash have evened out and returned to what has been a normal standard in long-term history. The numbers that show the continued growth belie the concept of seasons as the market rolls on past the daffodils of spring and into the high grass of summer despite a pause here and there. Some rising interest rates coupled with home price increases have created an affordability gap in some markets where the price of home ownership rises faster than buyers’ ability to afford the increases. This would account for some of the sluggishness during some periods of this year in some townships, but not all. I am frequently asked why there seems to be more houses for sale recently. People are surprised by the blossom of lawn signs when there’s supposed to be nothing for sale. Improbable as it may seem, both situations are true: there is more for sale now and inventory continues to be tight. “More” is a relative term. Right now there’s more than the “less” that existed earlier in the spring. As summer starts in this month of June we are actually time traveling back to March/April in real estate time and there’s probably more than one reason, but, mainly, it’s Tax Reform. The confusion and apprehension surrounding the roll-out of the tax reform legislation at the beginning of the year created a pause in the housing market. Real estate, like any other market, hates uncertainty. Compounding that uncertainty was the secrecy used to draft the legislation and the opposition’s apocalyptic predictions based on no facts. Jeffry Otteau, New Jersey’s premiere prognosticator of property trends predicted at the beginning of 2018 that the hubbub surrounding tax reform would delay the spring real estate market. He said that the facts would start to trickle out in a few months and people’s anxiety would begin to abate. When that occurs, he predicted, the spring market would flourish as always. That is exactly what seems to be occurring in late May and June. We are where we should have been, inventory wise, in March. The spring market has become the summer solstice market. This season’s market was envisioned as the most robust ever. We were supposed to be out of inventory to sell by now. The demand has not been slaked, just suspended and, now, it’s re-appeared, rising temperatures notwithstanding. Prices are still rising, listings are still coming on, multiple offers are still appearing, towns not usually hot are heating up as the temperature radiates out from the most popular towns. I’ve had active summers before. In Augusts past, when I’m supposed to be sitting under a tree for lack of something to do, I have been knee-deep in transactions. There’s no guarantee that because it’s summer the market will fizzle. It’s not a given that a late spring market will cool in summer’s heat. July is traditionally a big closing month for transactions beginning in April and May. This year that will probably translate to August and September. The momentum we’ve been used to is back, a late guest to the property party. HUD doesn’t get many headlines. Even this story was buried in the back pages. It’s the 50th anniversary of the Fair Housing Act of 1968 but it’s seems it’s more under siege than celebrating a milestone. This historic legislation, hard won and emanating from the cauldron of the Civil Rights Movement in the 60’s, is, in my view, inviolable. It was drafted to correct an inequity and to restore the civil rights of a segment of Americans suffering from long standing housing and lending practices. Critics have called it “social engineering”. I believe it’s simply an attempt to put in to practice an ideal this country was, supposedly, founded upon. At the end of March I attended the Spring Housing Workshop hosted by Jeffrey Otteau of the Otteau Group, Inc. Mr. Otteau is generally recognized as one of the foremost authorities on New Jersey real estate. His seminars are always packed with facts which support his conclusions. Looking back on his prior predictions, he is invariably correct. Mr. Otteau was as bullish about the New Jersey housing market as he has been since the real estate boom more than 10 years ago. It’s been 10 years of recovery since the Great Recession and the US economy has enjoyed the 2nd longest growth period on record in the last 9 years. Current annual economic growth is 2.9% and the national average of unemployment is 4.1%. New Jersey’s unemployment rate is now 4.7% with an estimated 99,000 jobs being created in NJ in 2018. We are a “book-end” state with our jobs market heavily dependent on the trends in New York City and Philadelphia and our employment figures will rise and fall in proportion to the trends there. The graph above shows the housing sales volume in 2017 of purchase contracts from 2005 to 2017. That period of time is used since 2005 was the peak of the boom years (the decline started in 2006 and bottomed out with the recession). The peak of the boom in 2005 was fueled by the sub prime mortgage market which eventually exploded. You will notice that 2017 outstripped 2005 and that was done without a sub prime mortgage market. The numbers of housing unit contracts in New Jersey is surging but the prices of homes have not completely recovered in New Jersey. This graph shows that New Jersey is 21 points below the national average in price recovery. The US has recovered 112% of housing prices since the end of the recession while New Jersey has recovered only 91%. The reasons for this are the same as the challenges New Jersey faces with high taxes, restrictive zoning and a lack of new residential construction. Single family building permits were at a low of about 10,000 filings in 2017, compared to 22,000 filings in 2005. That’s also a factor in the current lack of inventory. We brought this on ourselves by electing officials who opposed “sprawl” and imposed more and more restrictions on housing starts through zoning laws. Additionally, when there’s a lack of new construction sellers don’t move out of their older homes and move into the new, therefore reducing the number of older homes on the market. Other factors include more seniors aging in place and younger buyers being “zoned” or priced out of the market. 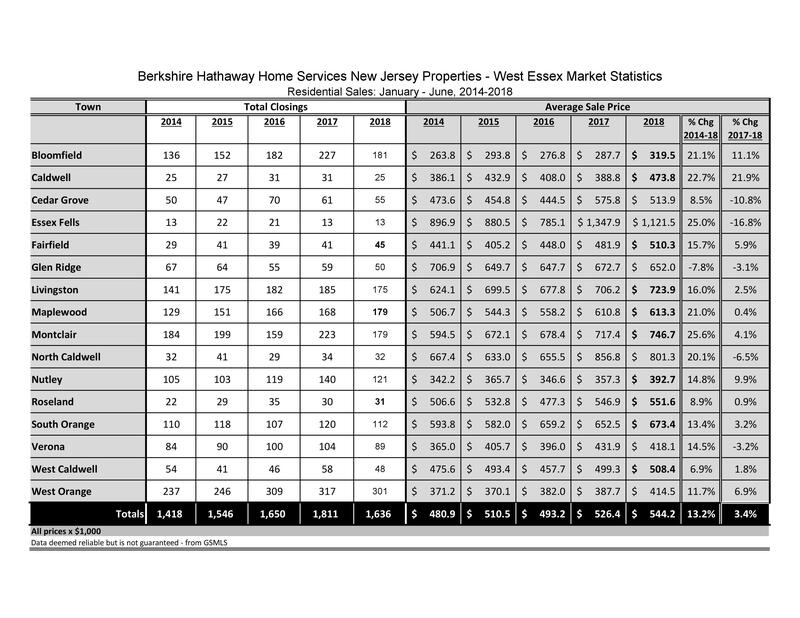 Notice on the above graph that NJ sales are rebounding and volume is increasing differently by price point. The higher the price point the higher the volume increase and the lower the number of increased units sold from 2016 to 2017. The over 2.5 million segment shows a hefty 11% unit increase but that only reflects an additional 34 units in 2017 over 2016. Unsold inventory also increases as the price point increases. Also, numbers of buyers per 100 sellers decreases as the prices increase. Prices in New Jersey were up 4.6% on average, statewide in 2017. In the first 2 months of 2018 the number of pending contracts was the highest its ever been. This chart shows the absorption rate by county. This is the number of months it will take to sell what’s on the market. Notice that Essex County is one of the fastest. The number for western Essex, minus the more urban eastern Essex cities and townships, is even lower with many townships like Montclair, Glen Ridge and Maplewood under 2 months of supply. If you’ve followed this blog in the past you will notice the difference from past Otteau absorption rate charts. Now almost the entire state is “in the green” which are the lowest months of supply as opposed to past charts showing trends of longer months supply. The southern counties are bulging with supply reflecting weaker markets since the collapse of Atlantic City and the aftermath of Superstorm Sandy. 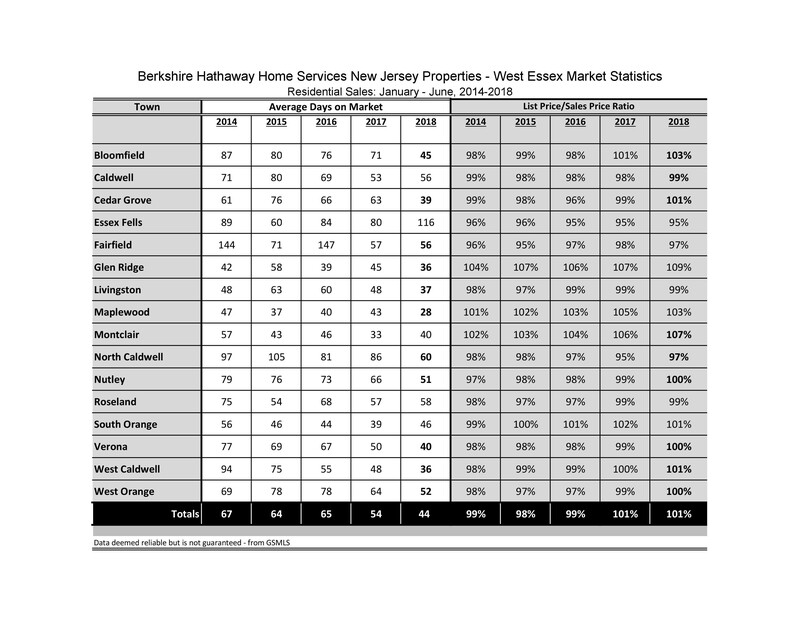 By 2023 a NJ buyer will have, alarmingly, 22.5% less buying power than the current year because of mortgage interest rate increases, price increases and other economic factors. The lesson to be learned here, according to Mr. Otteau, is DON’T WAIT! Buyers need to act before their decreased buying power forces them into smaller, less desirable houses or ejects them out of the market altogether. Sellers, also, should not sit on their hands if there is a desire to sell. The longer a seller waits to get a home on the market, the less buyers there will be for that home based on the factors above. These challenges are intertwined with all of the positive trends in the NJ housing market and some of the challenges are the result of the bull market and the improving economy. As I mentioned earlier, Mr. Otteau was very positive on the housing outlook for the foreseeable future as the housing recovery picks up steam. We have been in recovery for 10 long years, are now in a robust but normally expanding market in the midst of a strong economic recovery. Opportunities and challenges exist side-by-side. The spring market will be a robust one but inventory is still critically low, interest rates are on the rise which adds some added incentive for both buyers and sellers. Buyers will lose buying power with each interest rate hike, so time is not on their side. Sellers will have less buyers who can afford their asking price as buying power decreases so time is not on their side either. Tax reform is not predicted to have a big effect on the housing market, according to Mr. Otteau, so that should not be a dis-incentive for buyers or sellers. See you next month with all the details. I recently attended a seminar by Jeffrey Otteau who is generally acknowledged as a principal authority on New Jersey real estate. His company, Otteau Group Inc., holds seasonal seminars on the state of the Jersey housing market. Mr. Otteau decided to research the details of the recent tax reform law to see its effect on the housing market and this seminar was the result of his investigation using the research capabilities of his company. Mr. Otteau’s aim was not political. I don’t know his political opinions and he took great pains to say that the facts will speak for themselves without embellishments based on ideology. As you can see above, the standard deduction has doubled, the mortgage interest deduction has a lower threshold and the state and local taxes (your property taxes and state income taxes) are deductible up to $10,000 combined. Personal exemptions have been suspended until 2025, the child credit has been doubled and the estate tax exemption threshold has been doubled as well. Tax rates for most incomes have been lowered. Right away a couple of issues stand out from these two charts. If you owned a home before 12/15/17 your mortgage interest deduction is calculated by the old rules, not the new. This has not been generally reported in the media. Most of the people I’ve spoken to are not aware of this concession to existing homeowners. Secondly, the tax table above shows that higher income taxpayers are paying more (or the same) in taxes, not less, and the taxpayers with lower incomes are, indeed, paying less. That’s quite the opposite of what’s been said about this reform. Let me say at this point that I am not making any political points either. However, it was an eye opener to me to see the facts against the perceptions in the court of public opinion. So, the question is: how much of a catastrophe is this new law? Mr. Otteau made the point that the dream of home ownership is driven by more than taxes and tax deductions. I’ve been saying this ever since I started selling homes in Essex County. Buyers know what they’re buying into in this area. Taxes are no bargain and they drive the quality of life which is the point of being here. The seminar discussed the fact that whatever debits are increased by reform may be offset by larger deductions and lower tax rates. Ongoing improvement in the economy will continue to drive the strength of home sales, especially in desirable housing markets. The spring housing market may slow slightly until the facts of the reform are fully understood. In the meantime, as a result of confusion, fear, political opportunism (on both sides) and faulty reporting, the inventory in the market is predicted to loosen up a bit but there is no wholesale slide in prices predicted on the horizon. Time on the market may increase but Mr. Otteau says that once the facts are widely known that will re-invigorate the market and offset any dip in numbers of sales. One of the basic facts that came out of this gathering was that tax reform may not hurt New Jersey as much as feared, but it may put us further away from where we need to be. That distance is a function of the state’s ongoing problems of out-migration (business and people), high state taxes, high levels of regulation, etc. These are core challenges that New Jersey needs to address no matter the federal tax code. People will continue to be attracted to the Essex County market, however, because of what it offers. Buyers have always been attracted to the county’s strength and have always understood the costs that bring those benefits.